For the worldwide online bidders at Newcastle auction house Anderson & Garland (20% buyer’s premium) there was, of course, nothing to match Raphael’s Madonna of the Pinks discovered in 1991 and sold to the National Gallery for £32m in 2003. However, some pieces of quality furniture were on offer. Among them was a Regency rosewood and parcel-gilt writing table from the duchess’ sitting room at Alnwick Castle. 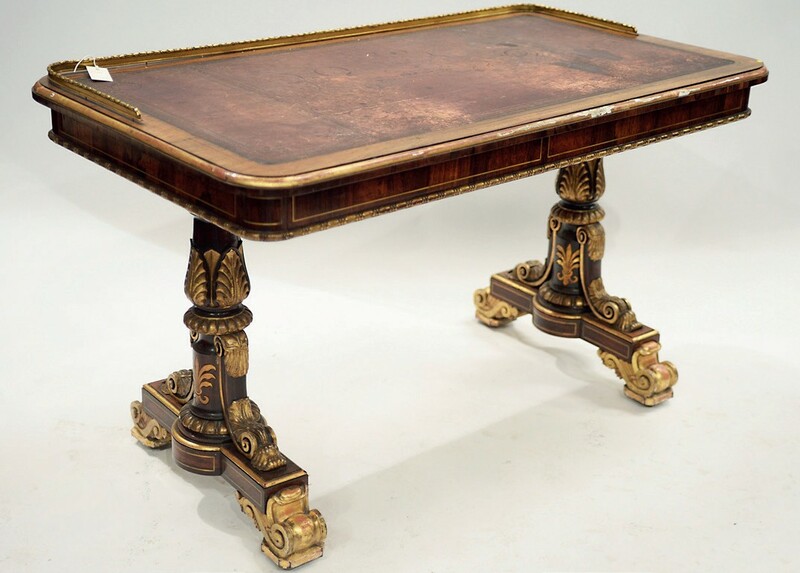 The table was attributed to Nicholas Morel and Robert Hughes, each eminent makers in their own right and part of the fruitful Morel & Hughes partnership from c.1821-28. The attribution was more than casual speculation. Morel & Hughes was engaged during the massive refurbishment of the Percy family’s London home, Northumberland House in the Strand, in 1823 when the bill for their decorating work in the ‘glass drawing room’ came to £34,111, 9s 7d, a remarkable figure translating to roughly £11m today. The writing table, more recently in the ‘duchess’ sitting room’ at Alnwick Castle, was estimated at a more reasonable £3000-4000 and sold at £8000. Topping the £100,000 day was the biggest item in the sale: a mahogany breakfront bookcase made c.1800 possibly to a design by Sir John Soane. Measuring a massive 21ft 8in wide by 10ft tall (6.64 x 3.05m) and featuring eight panel doors with brass trellis inserts above eight smaller doors and a centre section fitted with two pairs of glass-panelled doors, it was part of a suite made in c.1801, for the library at Albury Park, Surrey, later bought by the Percy family. The other sections of this suite are now at Alnwick Castle. Estimated at £200-400 at Newcastle, the bookcase went at £12,000. Consignments to Dreweatts’ (24% buyer’s premium) sale at Newbury on October 31 came from Kingston Lisle Park, a 17th century mansion and 250-acre Oxfordshire estate sold last year with an asking price of around £19m. 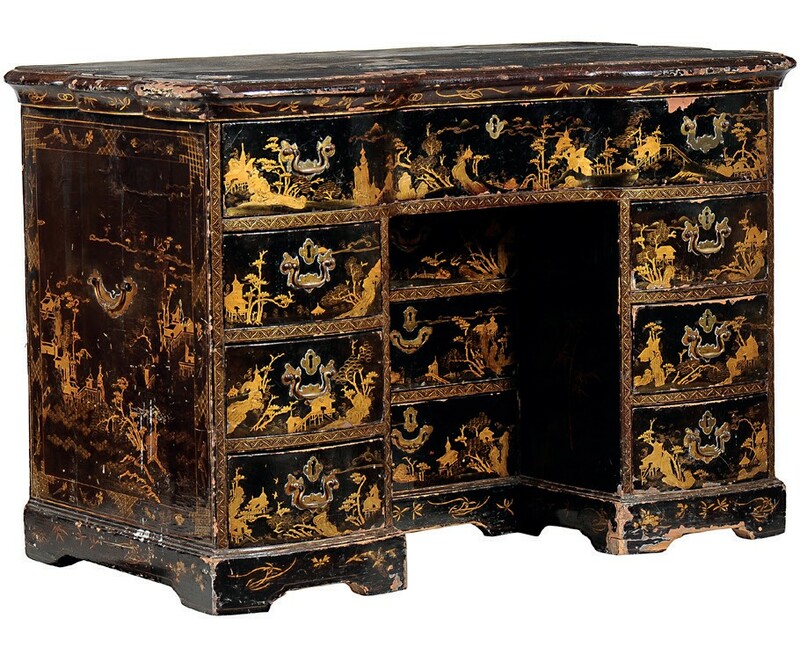 The eye-catcher here had the look of a piece of 18th century Chinese export furniture but, intriguingly, was a Victorian, almost certainly English, ‘black lacquered and parcel gilt carton-pierre kneehole desk’. Carton-pierre is variously defined as a type of papier mâché or reinforced plaster of paris and, said auctioneer Ben Brown, referred here to the layer of composition material covering the oak or pine carcass. “From the wide variety of blends and materials used as a ground for the lacquer it was difficult to pin it down to one named substance,” he said. A hugely fashionable style in the mid-to-late 19th century, it proved equally popular these days. The desk sold to the London trade at £4500 against an estimate of £400-600. Provenances are grand indeed when a property in Cheyne Walk ranks third, but this Chelsea address provided more solid selling furniture at Dreweatts. A c.1690, (85cm) wide oysterveneered chest of two short and two long drawers more than doubled expectations, going to a private bidder at £3500. A c.1815 mahogany and ebonised centre table with brass inlaid circular top, manner of John McLean, tripled mid hopes in selling at £3000.